Swedish company Blueair proudly claims that their new product, the Blueair ECO10, is "The World's Most Energy Efficient Air Purifier." This unit uses only ten watts on high speed, making it nearly ten times as efficient as the Energy Star standard for units of its class, and up to 95% more energy efficient than other units in its class. This is good, but does it filter the air? The answer is that yes, it would appear that it does. It contains three HEPA filters. Blueair's system uses Patented HEPASilent ™ Filter Technology - a method which they state combines HEPA filtration with electrostatic technology for improved filtration of the air. Blueair also makes water filters - such as the Blueair Direct Flow Water Filter. This, they claim, will remove toxins, chlorine, salt, bacteria, viruses, heavy metals, fluoride, nitrite and salt from water. It uses reverse osmosis to achieve this. Back to air purifiers, Blueair uses polypropylene for its filters. Polypropylene is an eco-friendly plastic that contains no chlorine molecules - and it biodegrades into carbon dioxide and water when it decomposes. If only everything plastic could be made of polypropylene! Many plastic products in fact are - in the recycling codes commonly seen on plastic items, it is commonly identified by the number 5 within a triangle of arrows. Blueair makes a portable air purifier called the Airpod. Is this a wordplay on the Apple iPod? It might be - the airpod does look a tiny bit like an iPod! Whatever, the Airpod is cute. It consists of a docking station and a filter, and is just over 6 inches wide. The Blueair Airpod contains both HEPA and ionizer technology. Blueair claims that it is so quiet in operation that you might even be unsure whether you have it switched on or not! Like many Swedish companies, Blueair seems to be committed to environmental responsibility. The Airpod is inexpensive compared to other, larger air purifiers, it is energy effiicient (well within Energy Star ratings) and all components of the Airpod are recyclable - including the packaging. It could be just the thing for travel. 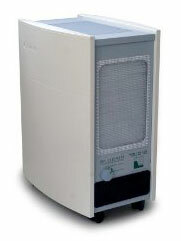 The Blueair 501 and 601 air purifiers were also designed with recycling in mind and Blueair claims that the components can be disassembled and categorized. These units also contain activated carbon filters for smoke control. We like Blueair's slogan - "clean air is a human right". And we like companies that do their bit for the environment. It seems like Blueair is doing theirs. Bravo!